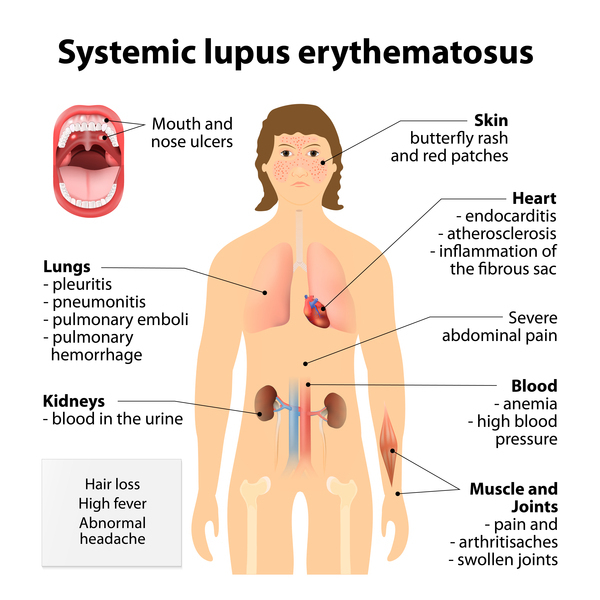 Systemic lupus erythematosus (SLE) refers to a a multi-system autoimmune disorder of connective tissue that has a highly variable clinical presentation, disease course, and prognosis. The exact etiology of SLE is very unclear, however it is characterized by the presence of auto-antibodies that target nuclear antigens within the cells of the body. This type of widespread auto-immune destruction of cells/tissues can lead to a very wide range of possible complications for patients (explained more below). Complement levels are decreased (C3,C4) and total complement activity (CH50) is also reduced. This is because of immune complex formation. Anti-nuclear antibodies (ANA): these are antibodies directed against the nucleus of cells. Sensitive but not specific for SLE. Anti-dsDNA antibodies: these are antibodies that are crafted against double stranded DNA. Specific, poor prognosis. Endocarditis: SLE can cause Libman-Sacks endocarditis. This is characterized by non-bacterial wart-like vegetations on both sides of the heart valves. Renal disease: SLE can cause both nephritic (diffuse proliferative glomerulonephritis) and nephrotic (membranous glomerulonephritis) kidney damage. Neurological disorders such as seizures and psychosis can be caused by SLE.